SEOUL, Sept. 7 (Yonhap) -- The new season of K-pop cable channel Mnet's rap competition program "Show Me the Money" will bring together the country's hottest hip-hop artists and producers, the channel's operator CJ E&M said Friday. 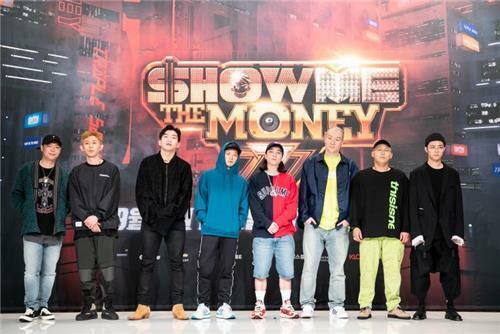 The first episode of the weekly show's seventh season, "Show Me the Money 777," is set to go on air on Friday for an eight-week run. The season will feature a panel of eight judges, comprised of the "hottest" artists in the hip-hop scene, the channel said, including The Quiett, Deepflow and Paloalto, who each runs a hip-hop label, as well as Code Kunst, who has collaborated with popular rappers like Tablo and Dok2. Launched in 2012, the famous rap competition show has brought a number of rappers to fame, including Loco and Mino, who is currently a member of K-pop boy band WINNER, through its past six seasons. Around 13,000 rappers competed in the preliminary round for the seventh season, conducted online, to pick the final group of 140 to appear on the show, according to its producers. "An interesting point to watch for this season will be performances by the best beat makers, whose work is coveted by every rapper in South Korea's hip-hop scene today," the show's chief producer Choi Seung-jun said in a news conference. The seventh season will adopt a new gambling system for the selection of the final winner, with each of the eight judges staking a total of 200 million won (US$178,100) on prospective winners, with the entire financial reward to end up in the hands of the final winner. The prize money is twice the sum of previous seasons. Swings, one of the judges, said that this season will bring the show, as well as the Korean hip-hop scene, one step further as rappers grow out of their rudimentary focus on rapidity and technicality in pursuit of artistry and individuality. "Competitors in previous seasons were focused on competing to have superiority in beat and technique as if they were competing in sports," Swings said at the press conference. "But now, the focus is on how well the competitors articulate their personality, life and fashion as rap becomes part of culture," he said.